EFT is based on the acupuncture meridian system and the surmise that when there is a negative emotion, there has been a disruption in the energy flow of the body. A sort of short circuit, a … ‘zzzzzt’… in the system. EFT Involves tapping on the ends of meridians with client focus.This helps balance the body’s energy system and in turn can neutralize old emotional patterns such as fear , sadness, anger, etc. that have been stored and have been a block to that persons health and wellbeing. EFT can be used with a wide variety of complaints-emotional, physical, mental, spiritual. The emotional root is found and tapped on. 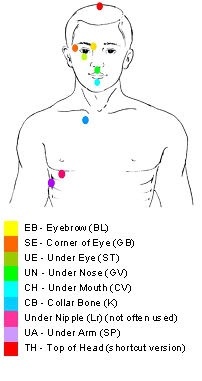 In simple terms, EFT is an emotional version of acupuncture, except we don’t use needles. Instead, we stimulate important release points by tapping on them with our fingertips.This serves to balance an otherwise disrupted energy flow, and properly done, the results are consistent and often dramatic. Learn the techniques and take them home to help with different challenges you might have!